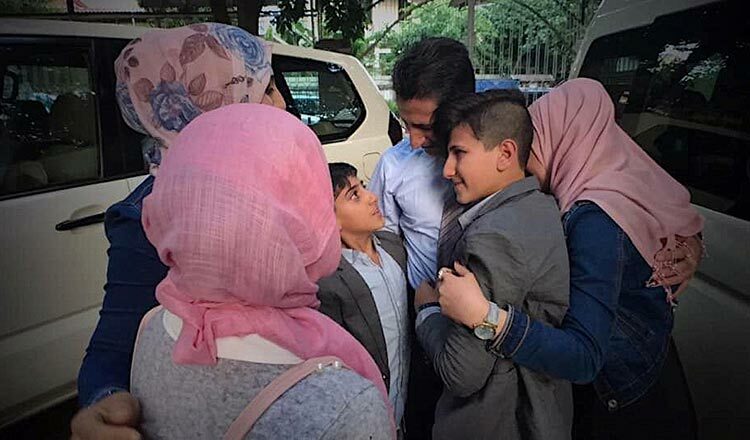 After years of living countries apart from one another, Abdullah Zalghanah, a Syrian refugee, was reunited in December with his wife and children in Phnom Penh. 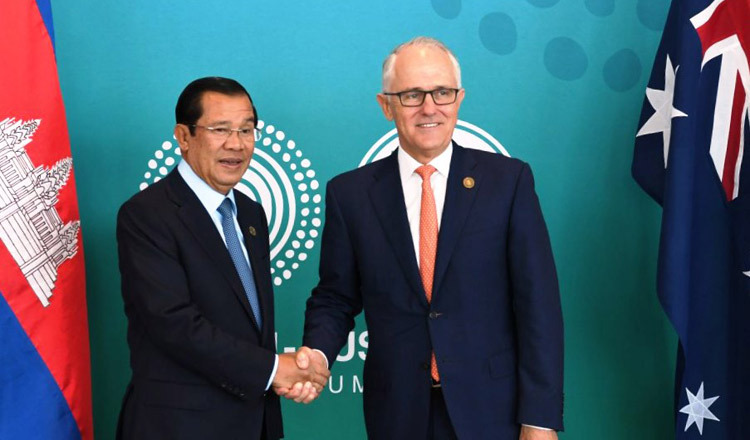 The heartfelt reunion, happened two years after Zalghanah was resettled in Cambodia under the Australian government’s $36 million deal for accepting refugees from the offshore detention centre in Nauru. For the Zalghanahs, there are still many challenges. 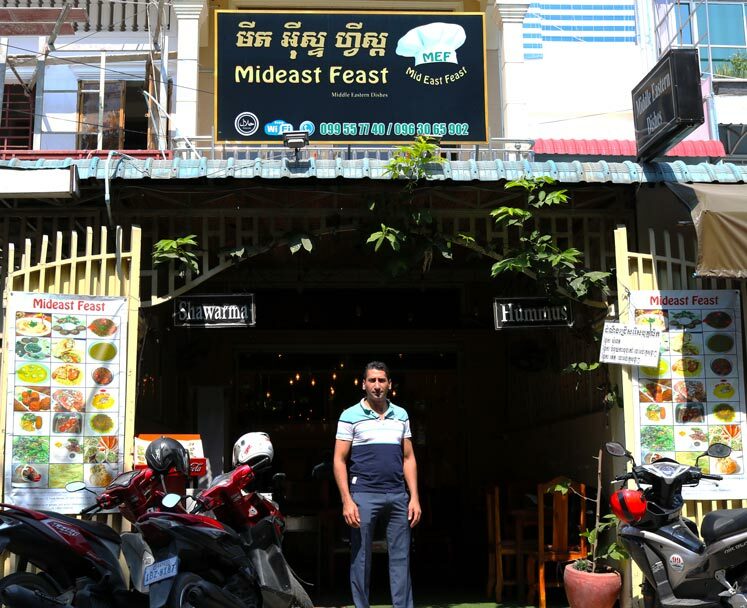 Taing Rinith caught up with the Syrian refugee in his Middle Eastern restaurant, Mideast Feast, in Phnom Penh’s St. 308. Good Times2: Can you tell us briefly about your life in Syria? Abdullah Zalghanah: I was born in 1978 in the city of Daraa, Syria. I had studied cooking since I was a child, and I had been working as a baker for 10 years and as a cook for 5 years in Daraa. I married my wife, Yasmin, in 2002. When we left our home, we had four children: two daughters and two sons. Good Times2: What did life look like during the war, shortly before you left your home country? Abdullah Zalghanah: The war started in Daraa in 2011. It was terrible. Dead people were everywhere in the city. Gunmen and snipers shot people. They did not care whether the people were good or bad, young or old. I was so scared. My wife and children were also scared. I stopped working, and we stayed at home all the time. But, it still was not safe because big bombs were destroying the building. Good Times2: When and how did you leave your country? Abdullah Zalghanah: We left the country six months after the war started. It was so hard for us because we had to walk and my children were very small. However, after a while, I found a car, and we took the car to Lebanon. Good Times2: How was life in Lebanon? Why did you decide to leave again? 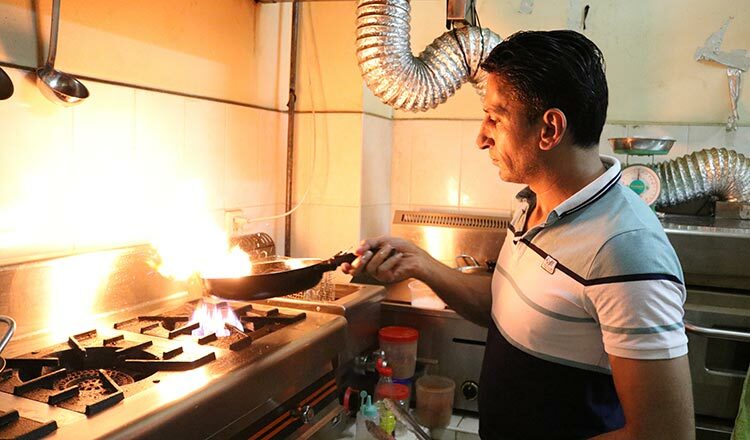 Abdullah Zalghanah: We rented a small house in Baalbek, and I worked as a baker at a local bakery. However, I could not stay there for long because a group called Hezbollah was capturing Syrian men, who had fled from their country, and sent them back to Syria to fight for the government. If I had been caught and sent to fight in the war, my family would have lost me forever. My family was safe in Lebanon, and Yasmin found work with UNHCR (United Nations High Commissioner for Refugees). So we decided that it was better for me to leave them at that time. It was just 6 or 7 months after we left Syria. Good Times2: Where did you go after that? And what happened there? Abdullah Zalghanah: Alone and sad, I went to Egypt in 2012. I resumed my work as a baker, but I was paid only $ 100 a month. It was not even enough for myself, and I could not send any money to my family. Then some of my friends in Egypt spoke to me about going to Australia for a new, good life. So I left Egypt only after 2 months. Good Times2: Did you make it to Australia after that? Abdullah Zalghanah: No, I could not go straight from Egypt to Australia. I went to Malaysia and then to Indonesia. I could not live in these countries because it was too hard for me to rent a house to start a business. In Indonesia, I paid a guy to take me to Australia in a boat. I hoped to resettle there and bring my family to live with me. However, when our boat almost reached Australia, we were arrested. The police told us that a new policy no longer allowed foreign people to enter Australia on boats. I was taken to a refugee camp on Christmas Island, where I lived for 8 months. After that, I was brought to another refugee camp on Nauru Island. I lived there for 3 years and 3 months. Good Times2: How was your life on Christmas Island and Nauru? Abdullah Zalghanah: It was not really great, but it was fine for me. I have a good room, and the food was okay. There are some good activities, but I did not have to do any work. But, I was not happy when they (the authorities) sent us from one place to another, never asking us beforehand. In the camp, we could only do what we were instructed to do. I also missed my family very much. During the first 6 months, I could not contact them. Then I was able to talk to them on Skype once a week. When I talked to them for the first time in half a year, my wife and children were so happy that they cried because they thought I died at sea. Good Times2: How did you end up living in Cambodia? Did you have a good start? Abdullah Zalghanah: In 2016, the Australian government gave me two choices: to live in Cambodia or to go back to Syria. 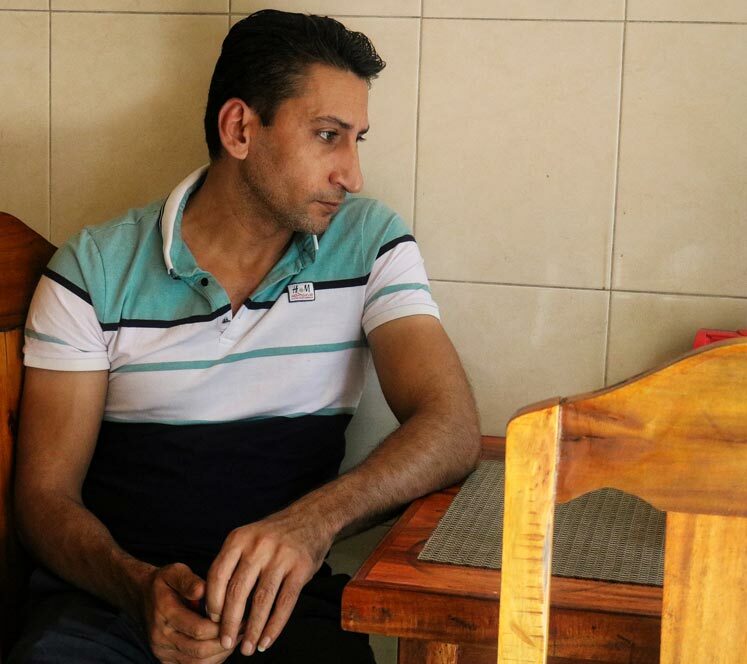 I did not want to go back to Syria, so I agreed to live in Cambodia but I made them promise me that they would bring my family to live with me in four months. The Australian government gave me $10,000 to start my restaurant. 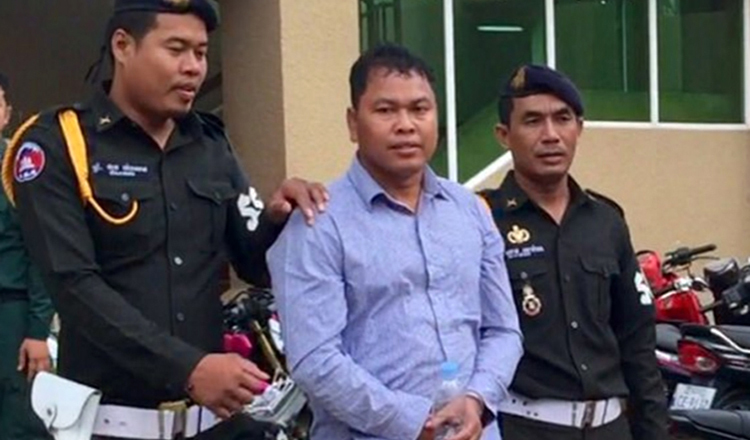 Two years on, and they still did not bring my family to Cambodia. Good Times2: Did you know why they took so long? And what did you do to demand that the Australian government fulfil its promise? Abdullah Zalghanah: I didn’t know what their reasons were, but I really missed my family. I also need them to help me in my restaurant. First, I sent them (Australian Government) emails, but they never replied. I became really depressed. So a few months ago, I declared I would go on a hunger strike if my family could not come to live with me. Then in November last year, they told me that they would bring my family to Cambodia. We were finally reunited in late December. Good Times2: How did you feel when you met your family for the first time after so many years? Abdullah Zalghanah: I am very, very happy. I can hold and kiss Yasmin and my children again, and I will never leave them. My children were very small when I left them seven years ago, but they are very big now. I was impressed by my wife, who worked so hard to feed our children. Good Times2: How does your wife, Yasmin, feel about living in Cambodia? Abdullah Zalghanah: She said it was okay because Cambodia is very similar to Syria, only the weather is much warmer. The biggest challenge is the language because all of us do not know much English or Khmer. Good Times2: How has Mideast Feast, your Middle Eastern restaurant, been doing? 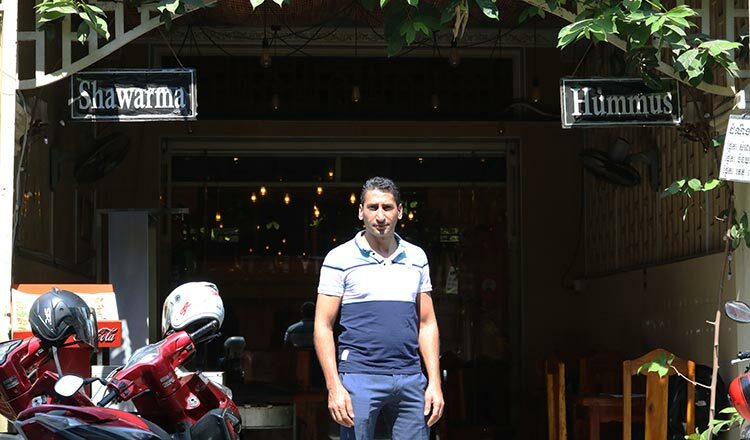 Abdullah Zalghanah: It has been quite hard since there are not many people from the Middle East in Cambodia. Most of the customers are mostly Westerners and some Cambodians. Usually, the business is fine, but sometimes it is really bad. Another problem is the ingredients, which have to be imported from other countries. Good Times2: Now that your wife and children are in Cambodia, do you have any plans for the future? Abdullah Zalghanah: For now, only now matters. I am doing my best to help my family begin their life here. They are having Khmer and English lessons every day with a local tutor, who is also helping my children make friends with the local kids. I also have to work harder in the restaurant to bring more customers and income. I need a lot of money to put my four children in schools. My eldest daughter, Nour, dreams of becoming a doctor. Good Times2: If the war ends in Syria, would you go back? Abdullah Zalghanah: Even if the war ends, as long as the (Bashar al-Assad) government is still there I will never go back. I want freedom, and there is no freedom living under that government.